What’s going on in those big glass balls? 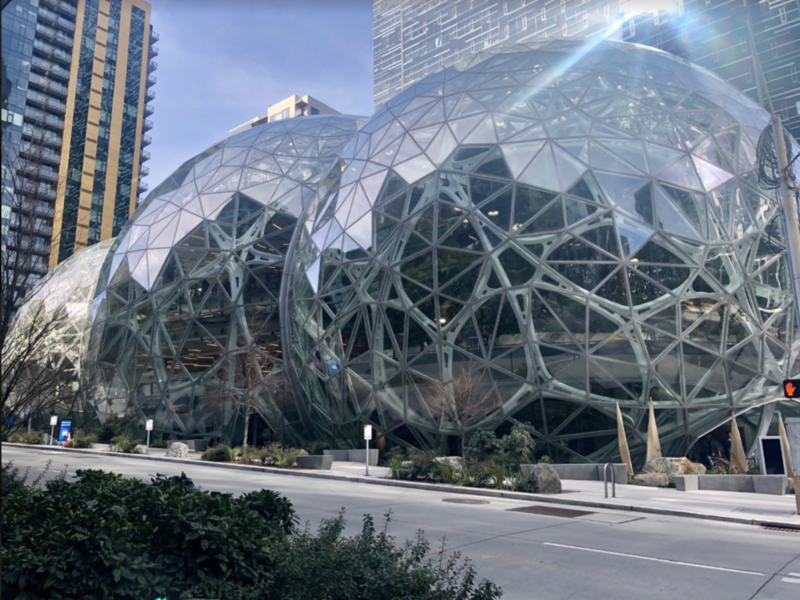 The idea is for Amazon employees to have a creative workspace. The office doesn’t need to look like an office anymore. When you think about it, what’s inspiring about a cubicle anyway? This is a collaborative workspace in a thriving rainforest. I applaud the inventive mind of Amazon CEO Jeff Bezos. The Spheres allow a direct link to nature right there in the center of urban Seattle. Upon entry to the biosphere, we were given some ground rules, i.e. we were asked not to lick the plants. “You’d be surprised, people do,” we were told. The first things I noticed were the temperature and the smell. It’s warm and a tad sticky, but still fairly comfortable. The average temperature is 72° with 60% humidity by day. At night, it’s colder and even more humid. There’s a mild tropical stench, possibly assisted by the presence the of corpse flower, named for odor reminiscent of rotting flesh. I felt like I was in Fern Gully. A 60’ Living Wall was crafted to reflect the way the forest is structured. There are approximately 25,000 plants in this vertical garden. Plants are watered throughout with a subtle mist, like produce at the grocery store. I would have called it a fish tank, but a friendly Spheres Ambassador informed me that the contraption I was admiring is actually a “paludarium” because it houses both fish and plants. It was created to represent the flooded basin of the Amazon forest. Look Mom, I learned a new word! The Bird Nest’s is the most exciting meeting room I’ve ever seen. 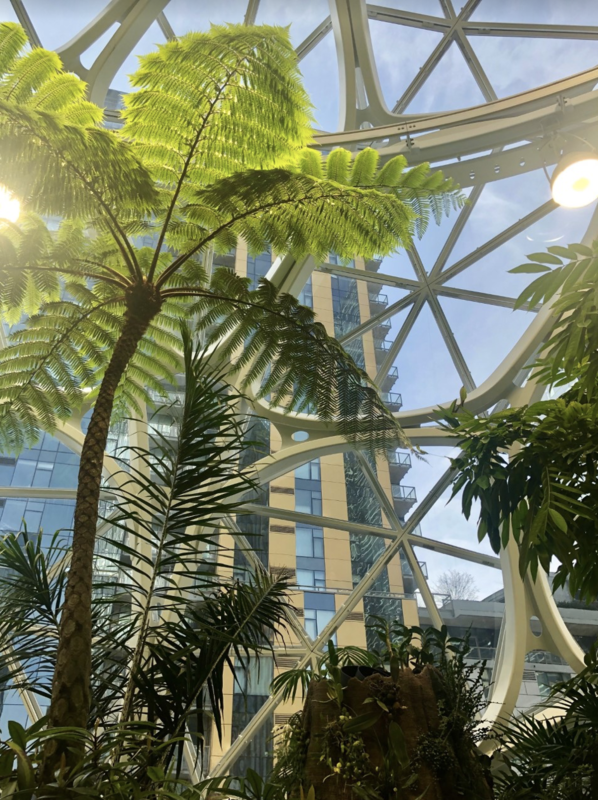 It’s up at the tip top of the Spheres on the fourth level with views of the entire rainforest. The suspension bridge leading to the nest is made of black locust wood which intentionally gives a little as you walk on it. The movement beneath your feet is an unexpected thrill. The Bird’s Nest is situated next to Rubi, the largest tree in the domes at 55 feet. She traveled 1200 miles via flatbed truck to be here. When it comes to refreshments, there are two options. General Porpoise is a casual coffee and donut joint featuring decadent stuffed confections and Kyoto style iced coffee made by a 7 hour drip. Danny and I opted for a sit-down lunch at Willmott’s Ghost, a cozy Italian spot open to the public but technically in the Spheres. They specialize in hearty Roman-style pizzas served with a sharp pair of scissors. When I inquired about the namesake of the restaurant, I was expecting a spooky campfire tale about some guy named Willmott. It turns out Willmott’s Ghost is a type of flower. Seattle is a special place. 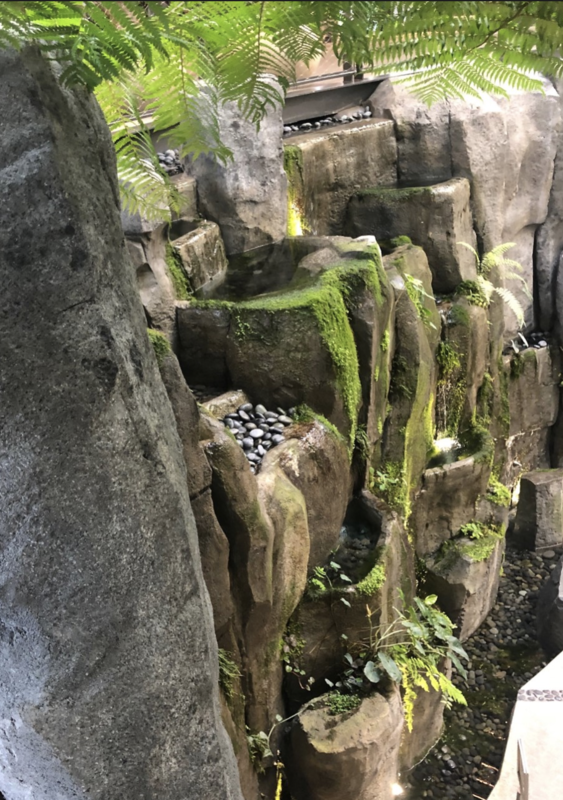 If I didn’t already know that Seattle is a special place, the fact that there’s a living, breathing rainforest complete with a waterfall in the middle of the city solidifies it.